What you see above is a bit of oyster shell with some curious small gouges in it. The oyster is Ilymatogyra (Afrogyra) africana (Lamarck, 1801) from the En Yorqe’am Formation (Cenomanian) exposed in Hamakhtesh Hagadol, southern Israel. The deep scratches are the trace fossil Gnathichnus pentax Bromley, 1975. As you can just make out in the lower center of the image, the grooves are overlapping series of five-pointed stars. 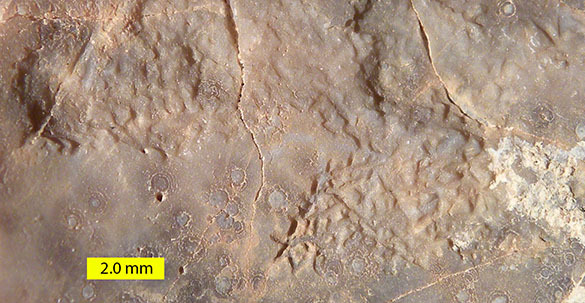 That’s what makes this trace so cool — the stars were made by the unique feeding apparatus of a regular echinoid (sea urchin). This is the business end of the modern sea urchin Strongylocentrotus purpuratus (a preserved specimen in Wooster’s collection). You see here in the center the peristome, which is a circle of plates surrounding the mouth, with the sharp five-sided teeth protruding from the echinoid’s Aristotle’s Lantern. These animals slowly graze across hard substrates, using their teeth to scrape the surfaces for algae, fungi and adherent organisms like diatoms. The biting actions of the Aristotle’s Lantern produce the star-shaped incisions we know as the trace fossil Gnathichnus pentax. I briefly sampled and studied an exposure of the fossiliferous En Yorqe’am Formation in 2003 during my first visit to Israel. The oyster shells in this unit provide one of the few examples of hard substrate communities in the tropics of the Late Cretaceous. The encrusters include ostreid and spondylid bivalves, the cyclostome bryozoan Stomatopora, and the agglutinating foraminiferan Acruliammina. Borings include those of barnacles (Rogerella elliptica) and sponges (Entobia aff. E. megastoma). 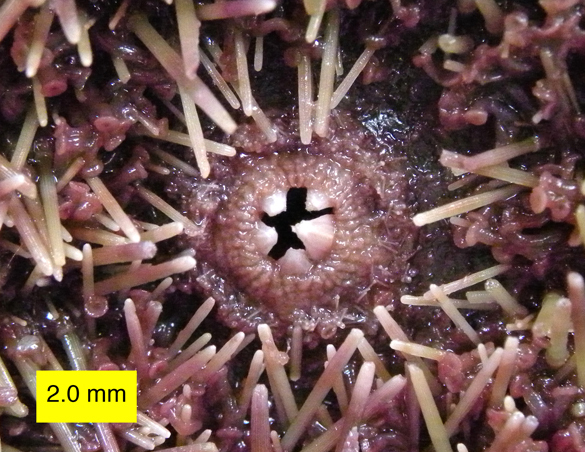 There is also a sea urchin present (Heterodiadema lybicum) that was almost certainly the maker of the Gnathichnus pentax traces. Bromley, R.G. 1975. Comparative analysis of fossil and recent echinoid bioerosion. Palaeontology 18: 725-739. Wilson, M.A. 2003. Paleoecology of a tropical Late Cretaceous (Cenomanian) skeletozoan community in the Negev Desert of southern Israel. Geological Society of America Abstracts with Programs 35(6): 420.